I thought I was done making soups this season but Mother Nature says no! 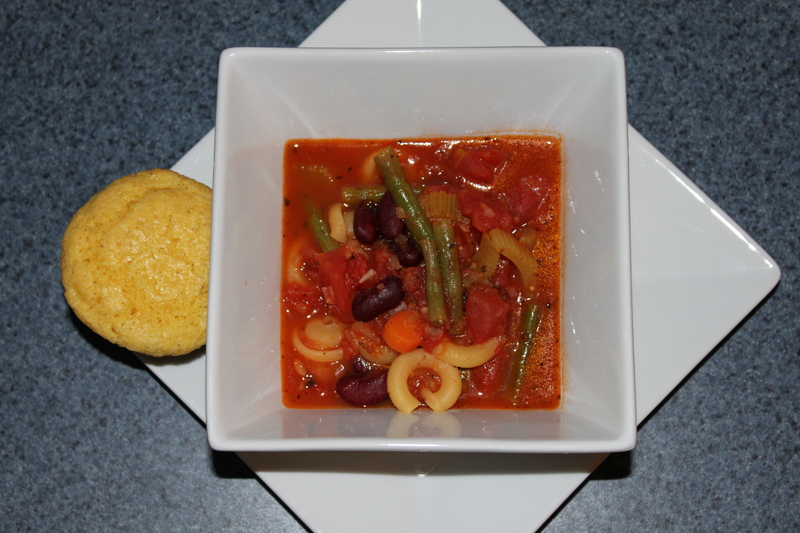 so here is another variation on the Minestrone theme from the Food Network Magazine by Ellie Krieger. 1 Heat oil in large pot over medium high heat. Add onion and cook until translucent, about 4 minutes. Add garlic and cook 30 seconds. Add celery and carrot and cook until they begin to soften, about 5 minutes. Stir in green beans, dried oregano and basil, 3/4 teaspoon salt and pepper to taste; cook 3 more minutes. 2 Add diced and crushed tomatoes and chicken broth to pot and bring to a boil. Reduce heat to medium low and simmer 10 minutes. Stir in kidney beans and pasta and cook until pasta and vegetables are tender, about 10 minutes. Season with salt. Ladle into bowls and top with Parmesan and chopped basil.